Graduation is always an exciting time for our students and for the University. However, there was additional excitement around this year’s commencement, as it was our first ceremony at Petco Park, home of the San Diego Padres and the 2016 Major League Baseball All Star Game! Our students work so hard overcoming challenges and making sacrifices to achieve this goal and we were thrilled to cheer them on as they rounded the bases and received their diplomas. National University System Board of Trustees, Chancellor and Presidents at our first Petco Park Commencement! As we know, the families and friends of our students offer so much support and we were thrilled to have students bring so many of their loved ones to this year’s ceremony. One of the greatest benefits of holding the ceremony at Petco Park, aside from the amazing atmosphere, concessions and activities was enabling our students to bring more loved ones to the ceremony than ever before. Approximately 2,400 graduates and 20,000 total attendees were brought together for this momentous occasion. I’d like to thank our esteemed Board of Trustees for helping to make this special day possible and for guiding our path as we educate the next generation of change makers and community leaders. We are so proud of our graduates and enjoyed celebrating their amazing achievement at Petco Park. As we continue to collaborate internally within the System, I’d like to share news of two new external partnerships that National University has formed. As teacher shortages continue to be a topic of concern nationwide, National University has launched a partnership with Teach For America-San Diego to prepare teachers and leaders in San Diego. More than 25 Teach For America-San Diego corps members are in the first cohort that begins training this summer through the Sanford College of Education, which was named after our good friend, philanthropist and entrepreneur T. Denny Sanford. Denny has been a wonderful supporter of National University and I am pleased to say that the Sanford College of Education is among the top ten largest schools of education in the country. The educational vision of Denny Sanford has led to a national effort to provide teachers with access to two research-based programs. One of the programs, Sanford Inspire is a framework for producing inspiring teachers and is based in part on Teach For America’s Teaching as Leadership techniques. 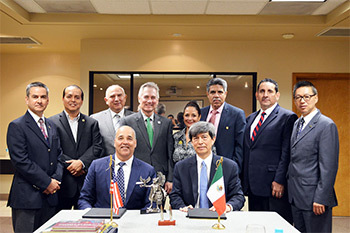 National University & CETYS University partnership formalized at a June 1 ceremony in Baja, CA. As part of a wider effort to increase educational exchanges between the United States and Mexico, National University has partnered with Centro de Enseñanza Técnica y Superior (CETYS) University. 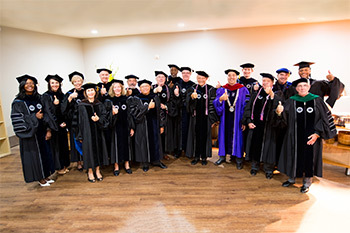 This agreement will foster the development of certificate programs and give CETYS students the chance to benefit from National University’s faculty expertise in the specialty areas of sustainability management, autism education and information technology. These three subject areas have been identified as growth areas for the U.S.-Mexico border region. The agreement also allows for exploring future areas of collaboration, such as joint research projects, creating visiting professorships and establishing possible dual degrees. Creating more cross-border educational opportunities and promoting a true global educational experience is something we encourage at all of our National University System Institutions.